David Warner's 72 not out was not enough to prevent the St Lucia Stars winless streak going to 15 games. 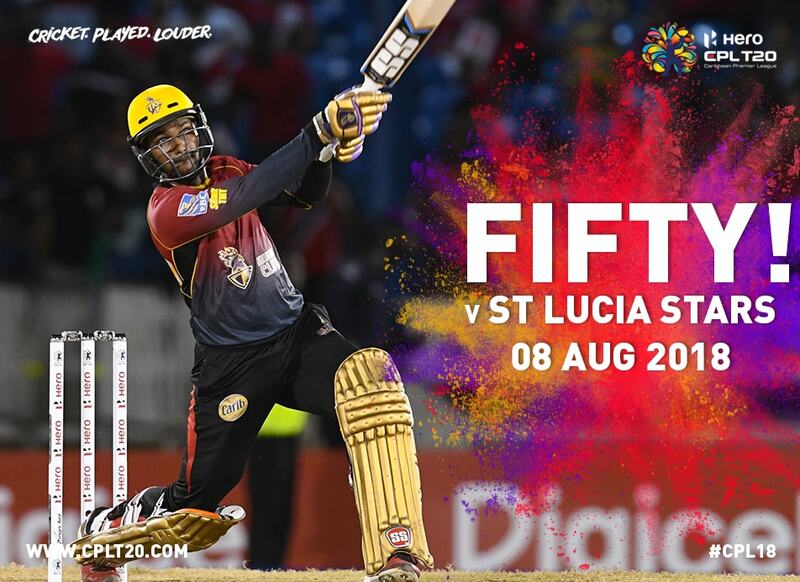 Darren Bravo hammered 94 not out from 36 balls to lead defending champions Trinbago Knight Riders to a five-wicket victory over St Lucia Stars in the ninth match of the 2018 Hero Caribbean Premier League (CPL), at the Daren Sammy Cricket Ground in St Lucia on Thursday night. Brendon McCullum supported well with 68 from 42 on a night which produced a world-record 36 sixes. The Knight Riders had been on the receiving end when Andre Russell brought Jamaica Tallawahs back from the dead back in game three, but produced their own resurrection in St Lucia. Kieron Pollard, Rahkeem Cornwall and David Warner all made half-centuries to lift the Stars to 212 for two, and they appeared to have the game in the bag when the Knight Riders went into the last five overs of the run-chase needing another 85 runs for victory. But Darren Bravo smashed five sixes from Pollard’s final over, with McCullum taking up the charge in the next over as four more balls went to or over the boundary. Suddenly, 53 of the 85 required had come from just 12 deliveries. Cornwall, who for most of the night looked like being the hero after blasting a 25-ball half-century and then dismissing both Knight Riders openers with the new ball, suddenly had to try and win the match all over again in the 18th over. He couldn’t do it. Two wides to start the over betrayed his nerves, before Darren Bravo thrashed three of the next four deliveries for six. Miraculously, from the Knight Riders needing 85 off 30 balls, the required rate was now below a run a ball. Darren Bravo launched a fourth six off the over and his 10th of the night to leave the Knight Riders needing just five runs from the last 12 deliveries. In just three overs, the Darren Bravo-inspired Knight Riders had plundered 80 runs and turned certain defeat into victory. McCullum was unable to see the job through, edging behind off Mitchell McClenaghan with Javon Searles falling the same way three balls later, but Darren Bravo was there at the end to see his side cross the unlikeliest of finish lines when Denesh Ramdin smashed the fifth ball of the final over for the 34th and final six of the night. Things had all seemed so very different in the first half of the night. Records were sent tumbling as the Stars became the first Hero CPL side to produce three half-centurions in the same innings and recorded their own highest Hero CPL total for good measure. 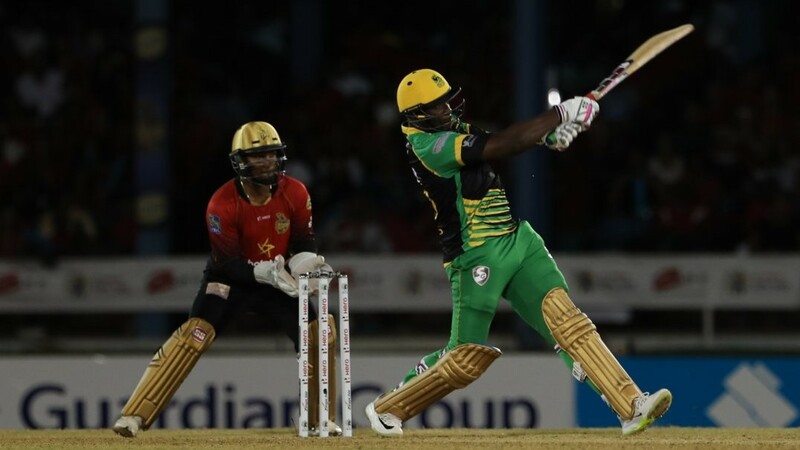 That was due in no small part to a blistering unbeaten 65 from 23 balls by Pollard; the Stars’ skipper reached his half-century in a Hero CPL record-equalling 18 balls, with seven balls sent over the ropes. Pollard himself was merely continuing the good work of Cornwall, whose promotion to number three in the order at the fall of Andre Fletcher’s wicket for 17 proved an inspired decision from the Stars brains trust as the big all-rounder helped himself to a half-century. There was also a welcome return to form for David Warner, who batted through the innings for his 72 not out from 55 balls. Warner and Fletcher took 50 from the PowerPlay before Cornwall arrived to really get things going. After a couple of sighters he smoked Fawad Ahmed’s leg-spin over the ropes. The next over from Shannon Gabriel brought two more sixes and a one-bounce four over midwicket. In all Cornwall smashed five sixes in his 29-ball 50, dominating a 79-run partnership with Warner before edging Searles to Ramdin. There was no respite for the Knight Riders, though, as Cornwall’s demise only brought Pollard to the crease. His 18-ball 50 matched Sohail Tanvir’s Hero CPL record for St Lucia against Barbados Tridents back in 2014. Pollard dominated the strike in the latter stages, facing 17 of the last 18 balls as Warner frequently scampered second runs to get his captain back on strike. Those last three overs added 61 runs to the total – a scarcely believable amount at the time, but one put firmly in the shade just a couple of hours later. Having had such success promoting Cornwall up the batting order, the Stars repeated the trick with the ball. Handed the responsibility of bowling the second over of the innings, Cornwall promptly had the dangerous Sunil Narine caught – by Pollard, naturally – for nine. In his next over he won an lbw verdict against Chris Lynn as wickets continued to fall. McCullum and Colin Munro kept things moving, but when Munro was smartly held by debutant Chandrapaul Hemraj at deep square-leg off Pollard the required rate had ballooned to 14 an over and the game appeared to be over. Darren Bravo walked to the middle with other ideas. Initially he kept the ball along the carpet, with three fours off Hemraj in over 11 an early indicator that he wasn’t giving up, and two more fours to follow off Pollard in the 12th. In truth, he was only warming up. The first of Bravo’s 10 sixes didn’t come until the penultimate ball of the 15th over, and even then it seemed like little more than an exercise in damage limitation. It was the 16th over that would really change everything. The first four balls were all struck clean and pure over the ropes as Pollard found himself unable to serve up anything but length and full-tosses. Thoughts of six sixes in the over were shelved when a miscue off ball five brought only two runs, but it was a temporary reprieve before normal service was resumed with another huge six to finish the over. The Knight Riders suddenly had belief. The Stars, who must wonder just what they have to do to end what is now a 15-match run without victory, suddenly had none. 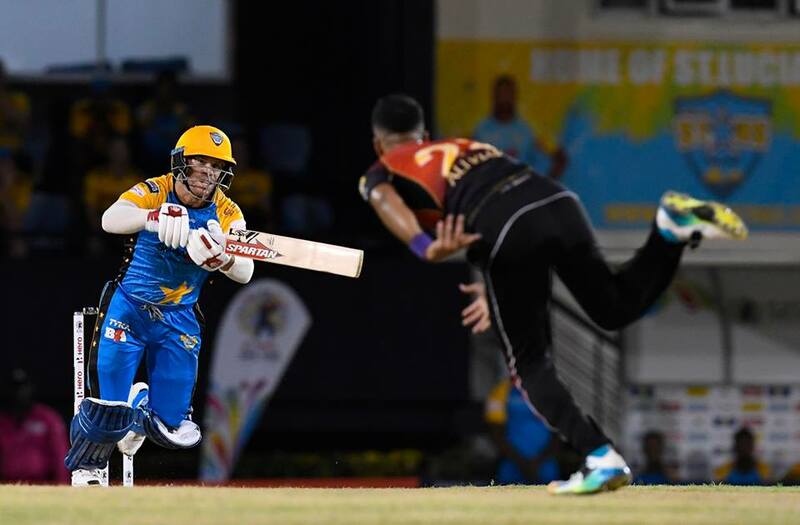 Summarized scores: St Lucia Stars 212-2 off 20.0 overs (Warner 72*, Cornwall 53, Pollard 65*; Gabriel 1-28) vs Trinbago Knight Riders 218-5 off 19.5 overs (Darren Bravo 94 not out, McCullum 68, Munro 25; McClenaghan 2-21) Trinbago Knight Riders won by five wickets with a ball to spare.